A while ago I wrote about how the fossil fuel divestment movement is gathering a huge momentum, as more and more funds, universities and companies are choosing to migrate their financial assets away from fossil. The movement is spearheaded by Bill McKibben, one of the founders of the 350.org group, who first organized rallies and lobbied key partners. “Almost from the start, academics have called it the fastest growing such anti-corporate campaign in history, and it’s clearly accelerating by the day,” said McKibben. But I don’t even think McKibben himself predicted how far divestment would go. It was launched more like an awareness campaign on the dangers of global warming. It’s grown fast, for sure, but this fast? Let me run some numbers: according to a report released by Arabella Advisors, $2.6 trillion in assets have moved away from fossil portfolios or 50 times more than last year. That’s not just a dent anymore – that’s serious cash! Of course, current circumstances are favorable. Oil prices are at their lowest in six years, and the coal industry is getting buried. If institutions had any second thoughts, this turbulent climate has made things very easy. Even the military is pulling out of fossil, and one of the biggest banks in the world thinks fossil fuel is a bad investment, an internal memo to its clients warns. “You have to ask whether you are investing in something that has a future, or in something that is on its way out – like coal,” said Bob Ward, policy and communications director at the London-based Grantham Research Institute on Climate Change and the Environment. Speaking of coal. Damn. Two of the biggest pension funds in California have lost $5 billion in assets last year by sticking to their fossil fuel investments, and they’re not alone. Think Progress reports Massachusetts’ pension plan lost half a billion dollars in the last fiscal year through its fossil fuel investments. Clearly, fossil fuel is not only an unwise investment for the environment, but also financially. While historically focused in the United States, the divestment movement now spans the globe. 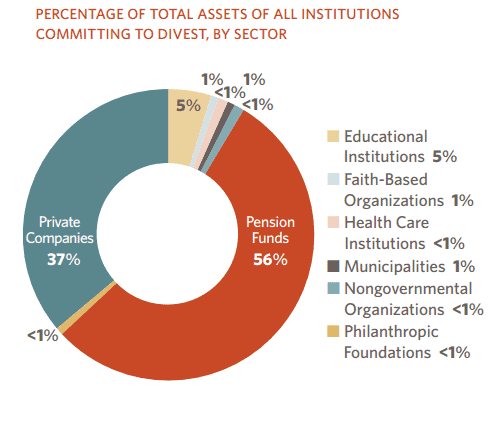 In 2014, 78 percent of divesting institutions were US-based. Today, 57 percent are US-based. Institutions that have chosen to divest represent more than 646 million individuals around the world. 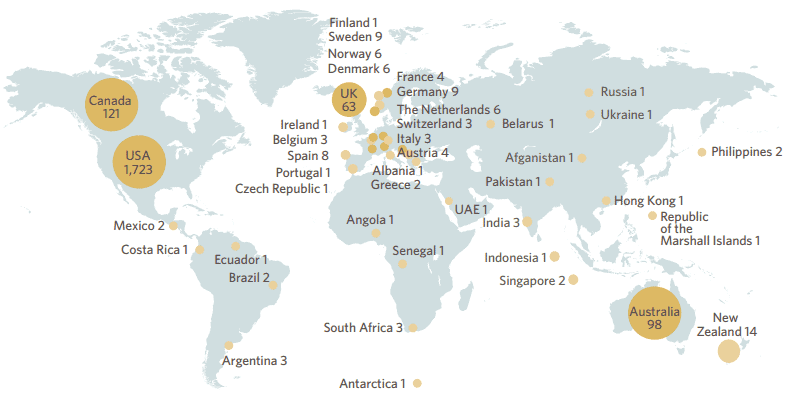 Globally, investment in clean energy reached $310 billion in 2014. Among those pledging to divest, many are also committing to invest in climate solutions: those institutions and individuals that have pledged to both divest and invest in clean energy collectively hold $785 billion in assets. Reports by Citigroup analysts, HSBC, Mercer, the International Energy Agency, Bank of England, Carbon Tracker Initiative, and others have offered evidence of a significant, quantifiable risk to portfolios exposed to fossil fuel assets in a carbon constrained world. The leaders of several of the largest institutions to divest in the past year have cited climate risk to investment portfolios as a key factor in their decisions. To date, 436 institutions and 2,040 individuals across 43 countries and representing $2.6 trillion in assets have committed to divest from fossil fuel companies. In anticipation of comments like “we still need fossil fuel”, I feel like I need to set some things straight. Yes, we still require fossil fuels for a functional society. The problem is that we’re too dependent. What’s absurd is the huge amount of capital trapped in this industry. The money needs to start flowing towards an industry that doesn’t have “dying” written on its forehead.